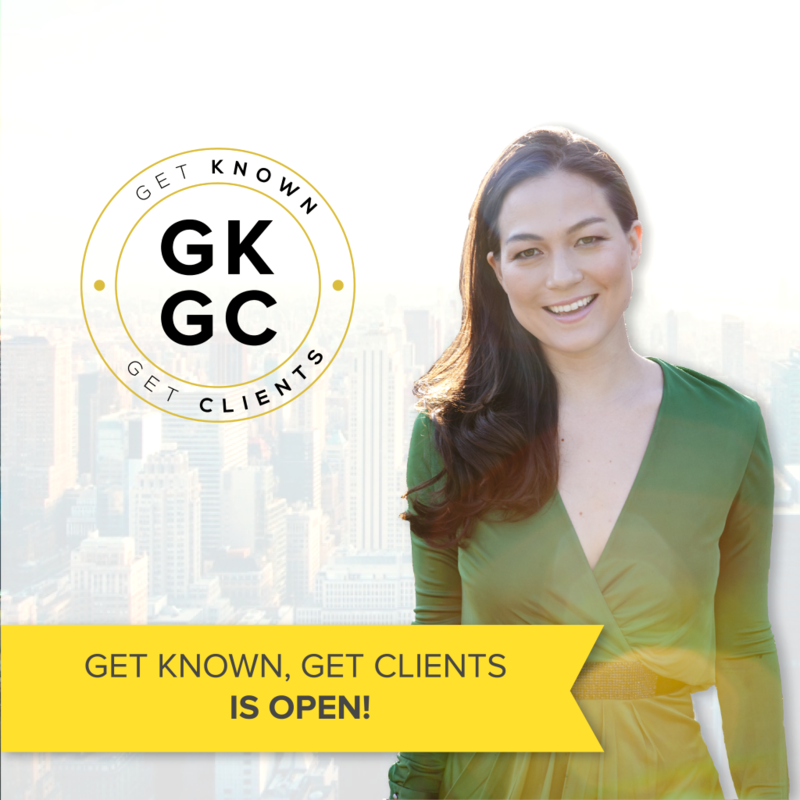 Get known, get clients is a 6 month program that teaches you how to earn more and stand out as the go-to-expert in your field. How to create a business model that doubles or triples your current income. How to restructure your offerings and elevate your brand. Fast & simple ways to get in front of the perfect buyers. How to create meaningful connections with out of reach people. How to successfully launch your programs or services. 6 Online Coaching Sessions – We’ll start the course with an Orientation webinar, where I’ll share my personal strategies to help you be successful in the course. You’ll get four LIVE Q&A webinars over the course of the program, where you can get personalized coaching from me — so you can get clients and recognition in even less time, and get moving fast. Our final training module will help you and I celebrate your successes together! 12 In-Depth Training Modules – Every month, two training modules will take you through the step-by-step Get Known, Get Clients system. You’ll have two weeks for implementation between each class — and lifetime access, so you can go through the course on your own schedule. Lifetime Access – We’ve designed this program so you can complete it in just 6 months. Want to go slower? That’s fine! You have lifetime access to the material, so you can pick it back up, review your favorite modules, and go through the course at your own best pace. Proven Email Scripts, Worksheets, and Special Resources – After over thousands of hours of testing, research, and real-world experience, we’ve thought out every possible roadblock to taking action. You’ll get over 40 resources (including word-for-word scripts, step-by-step processes, and more) so you can jump in with confidence. Students have said that the resources alone are worth the entire value of the program! In Get Known, Get Clients, you’ll get the step-by-step system that’s helped students across the world get clients consistently — and become seen as go-to experts. In Module 1, you’ll learn how to identify your ideal clients and target market, and how to get clear on their deepest needs. This will help you to create offerings they’ll be ready to invest big in. You’ll create a strong business model where you’re adding tremendous value and giving your target market exactly what they want to buy from you. I’ll show you how to choose which of 3 business models is right for your coaching, consulting, or service business — and how to price your valuable offerings. You’ll learn how to find prospective clients (both in person and online), and invite them into sales conversations. You’ll get the mindset shifts, talking points, and psychology behind sales calls, so you feel confident and natural in these conversations — even if you’re nervous or have never done it before. When you have a strong personal brand, people will come to you and happily pay you a premium — because you’re the go-to expert in your field. In this module, you’ll learn the 7 components of your personal brand map (including how to get endorsements that turn you into a leader). Giving talks positions you as an instant leader in your industry, and it’s one of the best ways to get clients. You’ll learn how to create an exciting signature talk from scratch, how to find and land great speaking opportunities, even how to plan and promote your own speaking event. And, how to use these opportunities to get dream clients. Want to get featured on a major blog or podcast in your industry? In Module 8, you’ll learn how to effectively pitch yourself for online publicity. You’ll also discover how to be strategic about these opportunities and turn one-time opportunities into 100s or 1,000s of subscribers — and potential clients. How do you get VIPs to put you in front of their audience, refer ideal clients to you, or give you powerful endorsements? In Module 9, you’ll learn how to get on influencers’ radar, develop long-term, meaningful relationships with them, and ask for their help in the right way. In Module 10, I’ll walk you through exactly how to launch your services — whether you’re consulting, doing a workshop, or hosting an event. You don’t need a fancy 3-part video series, or to invest in an expensive sales page. You just need to follow this 6-step launch process to write great email copy. In Module 12, we’ll celebrate your growth over the past 6 months! In this webinar, you’ll discover the key mindsets and strategies to set yourself up for the next level of business growth.